Have you ever thought about how many "first patients" you have had in your career? I certainly remember my very first patient in nursing school for a variety of reasons, but that's a story for another day. I don't think I really ever thought about categorizing all of the other "firsts" into one bigger category however. The first baby I saw being born, the first patient who coded, the first one who died, the first time I truly saved a patient's life, and then the first one who truly practically pulled my heart strings out. WOW! Yes, I've had a great career. Today I picked up a book sent to me for review and I couldn't put it down. 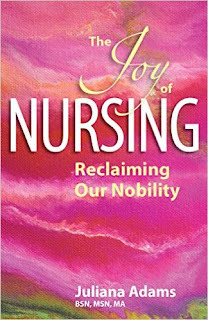 The Joy of Nursing Reclaiming Our Nobility by Juliana Adams, BSN, MSN, MA, is one of the most compelling books about a nurse's long career that I have read in a long time. She validates the reasons I wanted to become a nurse as she tells her stories and finds her concept of nobility in nursing. It's no surprise the book was a finalist for the 2016 USA Best Book Award. It's a must read for anyone considering a career in nursing. Adams doesn't mince words as she shares stories of her real world challenges and triumphs in the nursing profession. "To be a nurse you have to be tough, and you have to be gentle." She tells it like it is, and also leads the reader to see the silver lining and understand the calling to be a nurse and to truly make a difference in lives everyday.